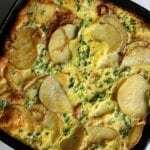 Potato Fritatta | JPMA, Inc.
Use up your extra potatoes with this tasty frittata – perfect for breakfast, lunch, or dinner. Pat dry the potatoes and onions. In a large, nonstick skillet set over moderate heat, heat 2 tablespoons of the oil until hot. Add the potatoes and salt and pepper and cook, stirring, for 1 minute. Add the onion and cook, stirring occasionally, until golden brown and just tender. Transfer to a plate. In a bowl, combine the eggs, Parmesan, and salt and pepper. Add the vegetable mixture and gently stir to combine. Add 1 to 2 tablespoons of oil to the skillet and heat it over moderate heat until hot. Add the vegetable and egg mixture and cook it over moderately low heat until golden brown and set on the underside. Invert a plate over the skillet and flip the frittata onto the plate. Add another tablespoon of oil to the skillet and slide the frittata back in, uncooked side down. Cook until completely set. Transfer to a plate and cut into wedges. Sprinkle with parsley.